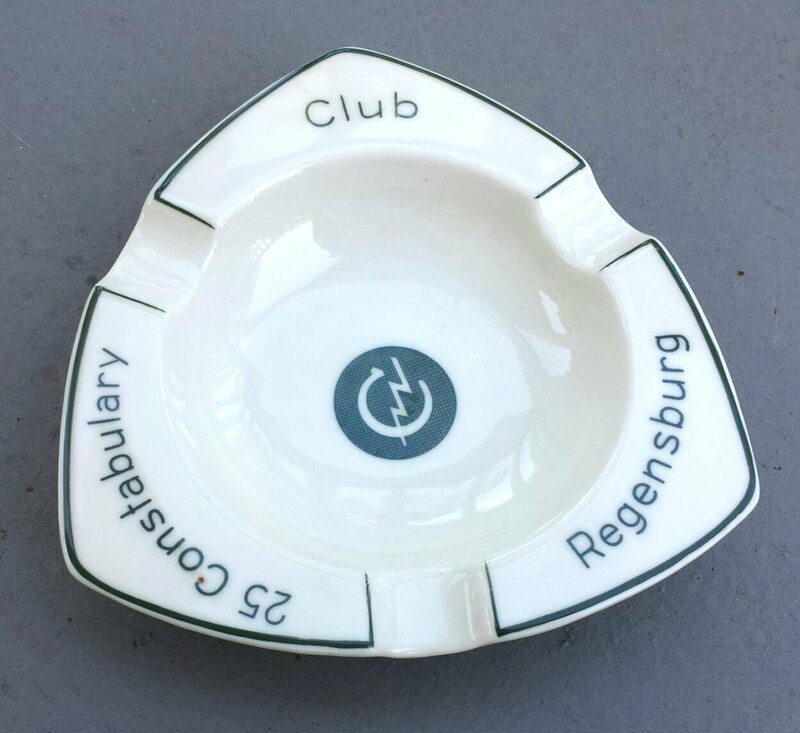 This souvenir ashtray is from post-war Regensburg, Germany. It is 3-sided, with “Club” on one corner, “Regensburg” on another, and “25 Constabulary” on the third. In the center is a 'C' with a lightning bolt. A constabulary is a military-type force of soldiers trained for police duties. In this case, it refers to U.S. troops stationed in W. Germany, beginning in 1946. In the town of Regensburg in the region of Bavaria, there was a 25th Constabulary. It featured many barracks with different names, and each had clubs which were hang-outs for soldiers. Examples were officer's clubs, flying clubs, the Diamond Club, service clubs, and EM clubs. "EM" has two meanings in military jargon: "enlisted men's" and "electro-magnetic" (military-army-computers). Judging by the lightning bolt in the center of the ashtray, I'm assuming this piece is from an EM club.